With a background in fine arts, Tony worked in several New York City advertising agencies as a Creative Director where he created and produced television commercials, and print campaigns. During this period he still actively pursued a career as a painter, and now he devotes his time almost exclusively to fine arts. He is equally comfortable working in both watercolor and oils. His paintings are developed from his sketches, his photographs and the use of live models. He prefers to immerse himself in one subject or theme at a time, thereby creating a “series” of paintings. Some of his series are: “Watercolor Portraits of Creative People”, “Oils and Watercolors of Marrakech”, “Impressions of Spain”, “The Emerald Isle”, “France: Paris and Brittany”, “The Hudson River”, “Floral”, and as a native New Yorker, he particularly enjoyed painting the series “Unique New York”. He was commissioned to design and create the artwork for the Philharmonia Virtuosi Orchestra in New York, as well as paintings for posters celebrating the 100th Anniversary of the Sound Shore Medical Center, and the Christopher Columbus Quincentennial. Tony’s paintings have been exhibited in various galleries in Manhattan, Westchester County NY, New Jersey, and Philadelphia. 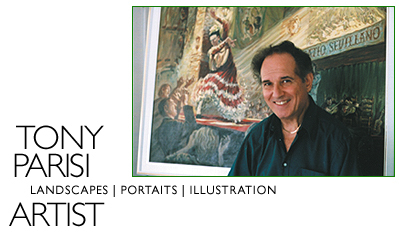 He has taught watercolor landscape and portrait painting, he judges juried exhibitions, and gives critiques. As a teenager, he attended the prestigious High School of Music and Art in NYC, and is a graduate of New York State Institute of Applied Arts and Sciences. Tony also studied at the School of Visual Arts, The New School, and the Art Students League. He is a member of the Gloucester County Art league, The Café Artists, and the Philadelphia Sketch Club. His paintings were the subject of a 10 page feature article in the 2003 Winter issue of Watercolor Magazine.